Above Masha, off-leash and doing her best to find rattlesnakes in the deserts of eastern Washington as Jason Rolfe does his best to keep her out of the snake-hiding grass. One of the cool things about the Patagonia 30l Stormfront pack in the Cusco Orange color, is that it multi-tasks for me in multiple ways. It saves me from having to remember to bring or wear something bright orange when it is fall time and I’m out fishing and exploring in territory where there might be people with guns. Where I fish there are a lot of those folks, even outside of hunting season. It also multi-tasks in that it is waterproof and I can wear it on my back, leaving my hands free to carry a fly rod or two, or a camera. I’m a recent transplant to the Northwest, and the fall and winter rains are daunting, especially when schlepping around sensitive electronics. The rains here are rarely just a passing shower. It rains hard, sometimes all day. 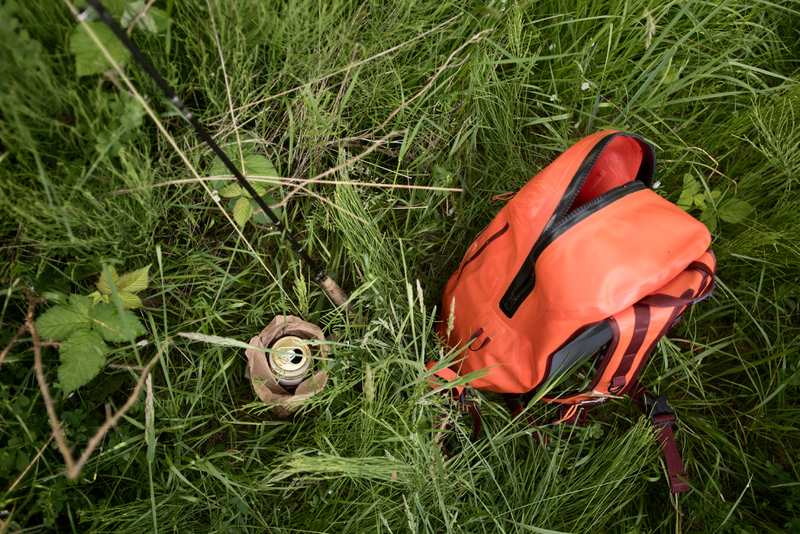 I’ve put this pack through some pretty solid deluges, snowstorms, professional level bushwhacks, sun-baked Bahamian flats and drought-stricken desert hikes to questionably fishy water. My items are always dry and protected from dust, sand, water, and small animals sniffing around for a snack. In classic Patagonia minimalist design, the shoulder straps are versatile and ergonomic without sacrificing comfort and my shoulders are happy with the weight upon them. Above Fly rod, check. Pack with camera and fishing accessories, check. Tall boy of Rainier in a brown paper bag, check. Only the necessities. I’ve found the 30L capacity is the perfect size for day missions; small enough that I can’t fit everything, but large enough for the stuff that I really need. In addition to a small camera kit (dslr, two extra lenses and other accessories), lunch, beer, requisite fishing items, extra layers and other wilderness necessities all fit comfortably within the main compartment. I can easily stash keys/licenses/identification and an iPhone in the interior zippered pocket. The Stormfront pack comes with two webbing loops that can be configured in a multitude of ways for external carrying capacity. I’ve lashed on rod tubes, tri-pods, cool sticks and rolled-up jackets with ease. With a small amount of logistical consideration, I have easily turned these adjustable webbing loops into an easy way to stow a second, fully rigged rod, for those never-ending bonefish flats that are also home to large Barracuda, or that great bass fishery with a solid Tiger Musky population. 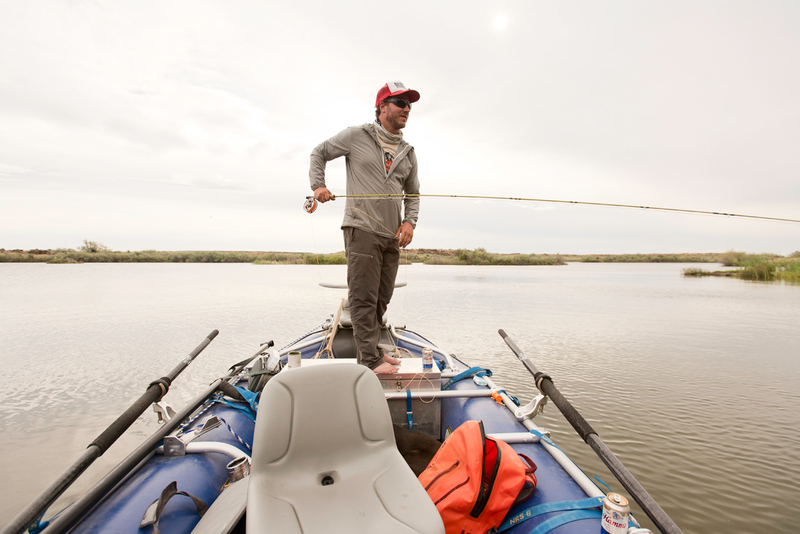 Above Jason Rolfe, barefoot and happily emulating Lewis and Clarks exploratory spirit on a warm-water lake in eastern Washington. There is a small zippered pocket on the outside that fits a granola bar, a multi tool, an extra bootlace or other small items. This pocket is not waterproof, so I mostly use it for crushed beer cans and micro-trash. The main TIZIP zipper is tough and allows quick access to the inside. I regularly use the lube that comes with it to keep it well-oiled and zipping in tiptop shape. Over almost a year of moderate to heavy use, it has never jammed, leaked or failed. This is a great heavy duty, fully waterproof day sized multi-tasking pack for pretty much any outdoor activity in which you need things to stay dry and protected. The Patagonia Stormfront 30l is available in three colors and retails for $299 at Patagonia.com.